Co-author of The Smartest Places on Earth which examines this changing dynamic and the transformation of “rustbelt” cities, the former industrial centers of the U.S. and Europe, into a “brainbelt” of design and innovation. Mr. van Agtmael serves as the Chairman, Chief Investment Officer, and Portfolio Manager at Ashmore EMM, L.L.C. Mr. van Agtmael founded Ashmore EMM, L.L.C. and is responsible for country allocation and overall maintenance of investment standards. He joined Garten Rothkopf as a senior adviser in 2012. Mr. van Agtmael was a Founding Partner at Strategic Investment Partners, Inc.
Mr. van Agtmael served as the Chairman of the Board, Chief Investment Officer and Portfolio Manager of The Emerging Markets Strategic Fund. He served as the President and Chief Investment Officer at Africa Emerging Markets and Chairman and Chief Investment Officer at SEI Institutional International Trust - Emerging Markets Equity Fund. Before founding EMM in 1987, Mr. van Agtmael served as the Deputy Director of the Capital Markets Department at International Finance Corporation, as the Division Chief in the treasury operations at The World Bank, the Managing Director at Thai Investment and Securities Company Ltd., and as a Vice President and International Lending Officer at Bankers Trust Company. While at IFC, he coined the term “emerging markets” in 1981 and created the IFC Emerging Markets Database. He serves as a Member of Advisory Board of Zaitoun Ventures. He serves as a Director at Ashmore EMM, L.L.C., Strategic Investment Partners, National Public Radio, Inc., Emerging Markets Investors Corporation, and Emerging Markets Management Company (Ireland) Limited. He was also a founding director of the Strategic Investment GroupSM. He serves as a Director of The Emerging Markets Strategic Fund, Africa Emerging Markets Fund, and Emerging Markets New Economy Fund, PLC. He serves as a Member of Advisory Board at Eurasia Group, Ltd. He serves as a Trustee at The Brookings Institution. He is a Board Member of the International Human Rights Law Group. He is a Member on the National Advisory Council for the Graduate School of Education and Human Development at George Washington University. Mr. van Agtmael serves on the Board of Trustees of The Lab School of Washington. He is Co-Chairman of its International Advisory Council, a Trustee of the NPR and a Trustee of the Smithsonian’s Freer Sackler Gallery. He is a Member of the Board of Trustees of the Washington Opera. He served as a Member of the Board of Directors at India Growth Fund, Inc. In addition, he serves on the Advisory Council of The Paul H. Nitze School of Advanced International Studies at Johns Hopkins University. He was an Adjunct Professor at Georgetown University Law Center and taught at the International Management Institute in Geneva, Harvard University Institute of Politics and Thammasat University, Bangkok. 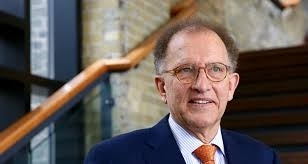 Mr. van Agtmael is the author of The Emerging Markets Century, Emerging Securities Markets and co-editor of The World’s Emerging Stock Markets and has spoken at numerous conferences and meetings worldwide. He is on the President’s Council on International Activities at Yale University and the Advisory Council of Johns Hopkins University’s Paul H. Nitze School of Advanced International Studies (SAIS). He is a member of the Council on Foreign Relations. Mr. van Agtmael holds an M.B.A. from the New York University, an M.A. degree in Russian and Eastern European Studies from the Yale University, and a B.A. degree in Economics from The Netherlands School of Economics at Erasmus University.